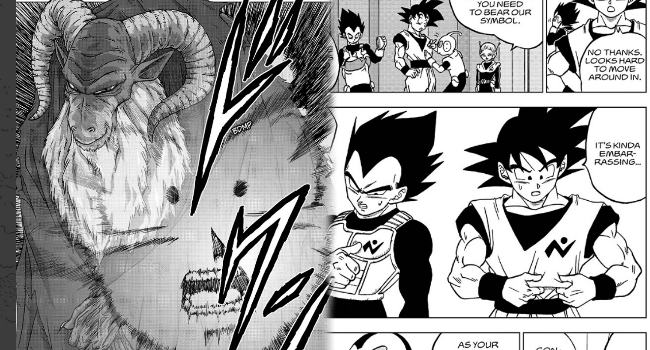 We begin this part far in the past, with the Great Lord of Lords and South Supreme Kai battling “Planet Eater Moro”, a robed warlock that kind of looks like a Saiyan great ape with ram’s horns. This master of magic has destroyed over 300 planets and added their power to his own, becoming nigh unstoppable. A strong introduction to a different kind of villain for this franchise. Ultimately, the Great Lord of Lords manages to sacrifice most of his own power in order to seal away Moro’s magic and allow the Galactic Patrol to seal him away for 10 million years. 5 million years later, when Majin Buu went onto absorb the Great Lord of Lords and take on his fat and “innocent” appearance, the seal on Moro’s magic was released. It seems strange that he only just now becomes a threat again. The problem is, Majin Buu is as useless as is usual these days and sleeps throughout. Instead, Goku and Vegeta volunteer themselves to the Galactic Patrol in order help bring down Moro before he can become the unstoppable threat he was in the past. Goku does this out of the apparent goodness of his heart (which means he probably low key wants to fight Moro) and Vegeta plays along because he wants to get a better gauge of Galactic Patrolman Merus. 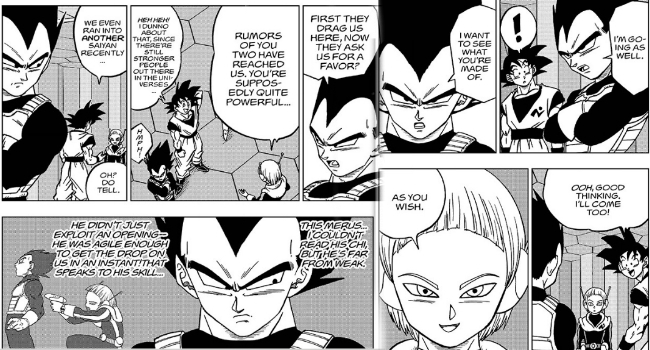 Vegeta’s studying of this new character is the most interesting thing about the chapter. Despite apparently lacking any Ki, Merus is wildly competent, able to get the jump on both him and Goku previously, and his actions within this chapter compounding that. With Goku and Vegeta temporarily inducted into the Galactic Patrol and a brief reintroduction of the galactic king squid, it’s a strange look into Dragon Ball’s galactic society, something that’s never been looked into too deeply after our previous assumptions that Freeza and his army just lorded over the entire known universe. After this, the Patrol become aware of a gang of punks robbing a train, Merus volunteers to sort them out. Eager to see more of what he is made of (and equally suspicious of him), Vegeta tags along with the patrolman. In a space train robbery reminiscent of the most recent Star Wars movie, Merus displays ingenuity, quick thinking and a level of skill and speed that shocks even Vegeta. When it appears the Punks are about to get away, only to be stopped by Goku jumping onto this ship, Vegeta is shocked that Merus sabotaged his ship without him even noticing it. This all leads me to believe that Merus will end up being in cahoots with Moro in some respect, but his obvious villain turn is the very kind of misdirection that Toriyama loves to do. The episode ends with the patrol getting a tip as to where Moro is and Goku searching out his Ki, only to be shocked by Moro reaching out back towards him when he detects him. Moro is an interesting new kind of villain, one who is both physically powerful (according to the patrol) but also powerfully magical. Magic has been an inconsistent factor in Dragon Ball, and is the kind of villain that could pose a new kind of threat to Goku and the gang through something beyond physical force. It’s an interesting new start to the story that introduces several new aspects to the Dragon Ball lore including this new type of villain and a look at the wider galactic society that doesn’t nesseserily involve the gods… yet. I’m looking forward to the next part. Posted on January 15, 2019 January 14, 2019 by WooderonPosted in Anime, Condensed Reviews:Tagged chapter 43, dragon ball, dragon ball super, galactic patrol, goku, jaco, manga, merus, moro, vegeta. Next Next post: JoJo’s Bizarre Adventure: Golden Wind Episode 14 – Express Train to Florence – Turtle Power!